COLUMBIA, Mo. – This summer at the Missouri Scholars Academy (MSA), approximately 330 high school students across Missouri will have the opportunity of a lifetime, and perhaps more importantly, a chance to be themselves. Since its establishment in 1985, more than 8,000 Missouri students have participated in the annual program, which provides students unique opportunities to expand their educational and social skills. This year, from June 13 through July 3, students will spend the bulk of each day in an intensive classroom setting, studying one of four individually selected subjects, including mathematics, science, social studies and humanities. Each Missouri high school is allowed to nominate one junior-to-be for the academy; larger schools may nominate more. Outside the classroom, students are introduced to a series of activities, workshops and discussions by guest speakers. This year’s program focuses around the theme of sustainability and “going green”. Students will get to learn from experts in the fields of Islam and the Holocaust and discuss the nation’s health policy. Participants also will get the chance to visit with someone involved in the Haitian relief efforts as well as match wits against the Missouri state Scrabble champion and chess grand master. MSA participants are among the top 0.5 percent of Missouri students academically. Individuals who attend the academy leave with the understanding that they have a responsibility to share their talents with others for the betterment of their local Missouri communities, Tarkow said. Many MSA alumni participate in programs such as Teach for America, Peace Corps or other not-for-profit organizations. MSA alumni also continue to succeed academically. Of those who are old enough, 98 percent of academy alumni have graduated from high school, 90 percent have graduated from college and nearly 2,500 alumni have earned graduate or professional degrees. The Missouri Department of Elementary and Secondary Education coordinated this year’s scholar selection process. 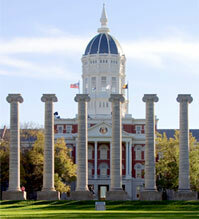 Funding for the MSA 2010 is provided by the state, the University of Missouri, and by private corporate contributions. Other aspects of the MSA 2010 are sponsored by the University of Missouri. EDITOR’S NOTE: A list of students attending the Missouri Scholars Academy, sorted alphabetically by city, is attached.